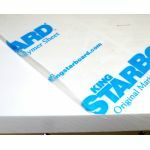 King Starboard Project Panels -- 1 Sq. Ft. (12"x12") -- 1/4" To 1-1/2"
Our project panels range in size from 1 sq. ft. to 8 sq. ft. in a variety of configurations. Thicknesses range from 1/4" all the way up to 1-1/2", and most are available in several standard colors.